CEO and cofounder of Telltale Dan Connors is very happy with how his company is doing nowadays. When the company was founded in 2004 on the tenets of episodic adventure games, Connors knew that it wouldn't be successful without being able to supply its games to consumers through digital delivery. While sales of Sam & Max seasons one and two were always good, the company has seen enormous growth of revenues in the last two years, with 2010 earning the company over $10 million. 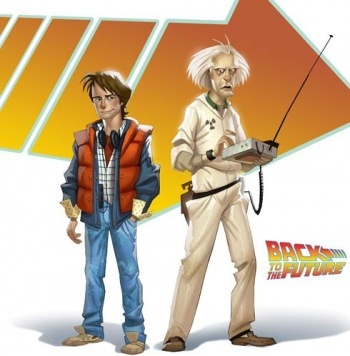 The success of Telltale's business model can be seen in Back to the Future. Episode one was released digitally for PCs on December 22nd, 2010 and sold more than 40,000 units in the first week. Telltale hopes to continue that trend by releasing episode two Get Tannen this week, as well as versions on the PlayStation Network, Mac and iPad platforms. "We can't do what we do without digital distribution," Connors said at a press event announcing the Jurassic Park game last night. "We certainly built the company getting ready for the market to move that way. I don't think retail is going anywhere. Nobody is buying retail iPad product or iOS products." The emergence of the iPad as a gaming platform may have caught many in the industry by surprise, but Telltale is ready to cash in on Apple's cachet. I played a bit of Back to the Future on the iPad and the touchscreen interface seems custom-made for Telltale's patented point and click adventure game style. It just works wonderfully. As for the PC, Telltale has benefitted from a close working relationship with Valve and the Steam distribution model. But is there cause to worry for Steam overtaking the whole market? "As long as Steam is a benign dictator, [it's okay,]" Connors said. "Steam knows its customer, they know how to communicate. They work very well with their partners. So that's all great." With Back to the Future fluxing, and the recently announced Walking Dead and Jurassic Park games coming down the pipe, it seems that Telltale is more actively at pursuing licensed games. Connors credits the company's success in landing these deals. "We were always pushing, but getting people to take us seriously was the issue," he said. "The way to do that is to show them the great product that you've already built, and you show them the potential to make money. I'm not saying that all license-owners are money hungry. A lot of people work with us, because they like that we're not going to trash the license; they care about story and they care about the integrity. But on the other hand, if no one is jumping into doing business with you, why would they?" Now that Telltale is working with big time movie, comics and TV properties, I can only assume that more and more companies will approach them to make games based on their licenses. And perhaps the properties will be a little more up to date, I mean, who wouldn't want to see an Inception or a True Grit game from Telltale?